2nd, Wednesday, 2:00 pm - Funeral, Billings, OK.
3rd, Thursday, 10:30 am - Seniors Luncheon, Trinity Lutheran Church, Norman, OK.
25th, Monday, 10:00 am - Funeral, Moore, OK.
17th, Sunday, 9:00 am - First Christian Church, 200 E. Adams St.,Crescent, OK.
31st, Sunday, 7:00 pm - Benefit for Byron Berline, Tower Theater, 425 NW 23rd St., Oklahoma City, OK.
1st, Friday - Annual BBQ & Bluegrass, City Park, Scott City, Kansas, sponsored by the Scott City Arts Council. 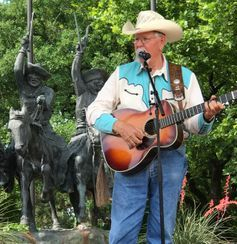 7th & 8th, Friday & Saturday - Pawnee Bill Wild West Show, Pawnee, OK.
13th, Thursday, 10:00 am - Public Library Program, Stigler, OK.
9th, Friday, 5:00 pm - Oklahoma Electric Cooperative Annual Meeting, Lloyd Noble Center, Norman, OK.
27th, Tuesday, 10 am-4 pm - GOSPELfest, First Baptist Church, Moore, OK. Jim emcee as well as performing on this full day of gospel music groups. 28-29th, Saturday-Sunday - Tom Mix Festival, Dewey, OK.